Toyota has revised the Yaris, with improvements to material quality and revised engines, meaning lower emissions and improved fuel economy. Prices are to be announced, but don’t expect much difference from the current model, which starts at £10,995. 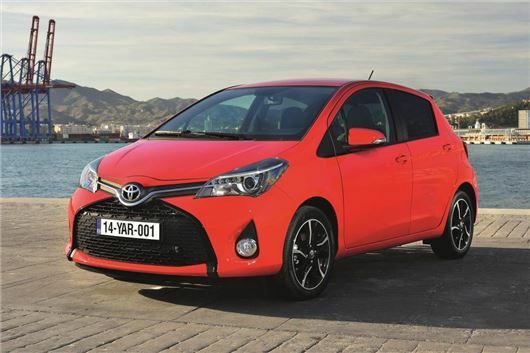 Cosmetically the Yaris has been given a look similar to that of the all-new Aygo, with a large, black grille dominating the front of the car. There are also new headlight and tail light clusters using LED lighting. The door design has also been revised to incorporate a more prominent crease down the flank of the car. The cabin has been redesigned, with a slimmer dashboard, a shorter gear lever and a new closed storage area. There’s a new touchscreen system and a new selection of materials to make the cabin feel more upmarket, including new seat trims and greater use of soft touch plastics. Changes under the skin are comprehensive, too. The steering and suspension have been reworked to deliver greater ride comfort and more enjoyable handling, while body rigidity has been increased by the use of additional welding points. There’s also improved sound-proofing to quieten the cabin. The hybrid model has been tweaked to reduce emissions, down from 79g/km to 75g/km. That means it’s eligible for London congestion charge exemption under the new, stricter rules. Toyota has also improved the 1.0-litre three-cylinder petrol engine, lowering its CO2 emissions to 99g/km. Power remains the same at 68PS. So when will this revised Yaris be available to buy.....I am currently looking to exchange my Yaris. I believe the Yaris facelift will be sometime in June - think dealers are preparing for the launch at present. The revised Auris has just been released. The new Aygo will be launched on 21st and 22nd June. Probably will be. They introduced a new Tungsten Blue for the Auris, but as the development of the Yaris is a proper mid-life facelift, rather than an adjustment of specs (as in the Auris), think there will be a change in colour choice.